The mural painted in Sparkbrook Birmingham was painted by two artists Mohammed Ali and Martin Travers. Here is their perspective on the experience of painting this wall. 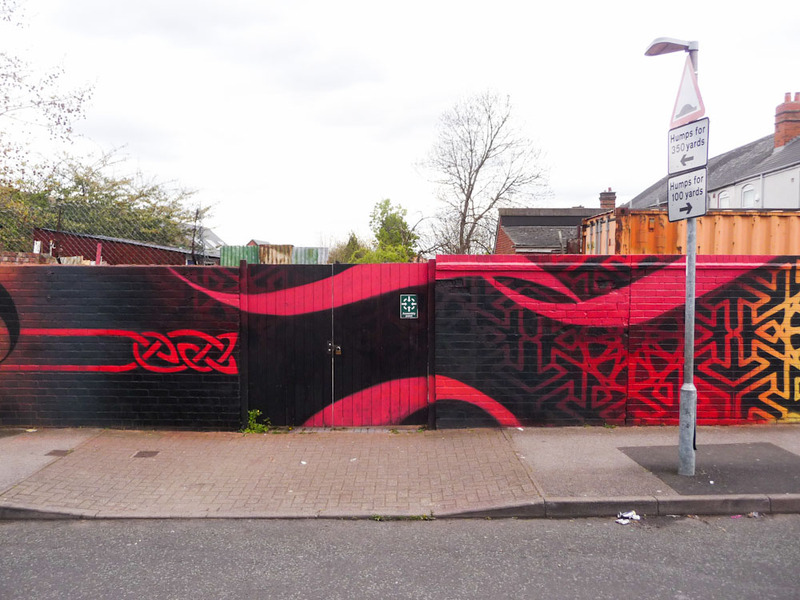 I recently had the pleasure of collaborating on an exciting mural project with the artist Mohammed Ali in Birmingham. 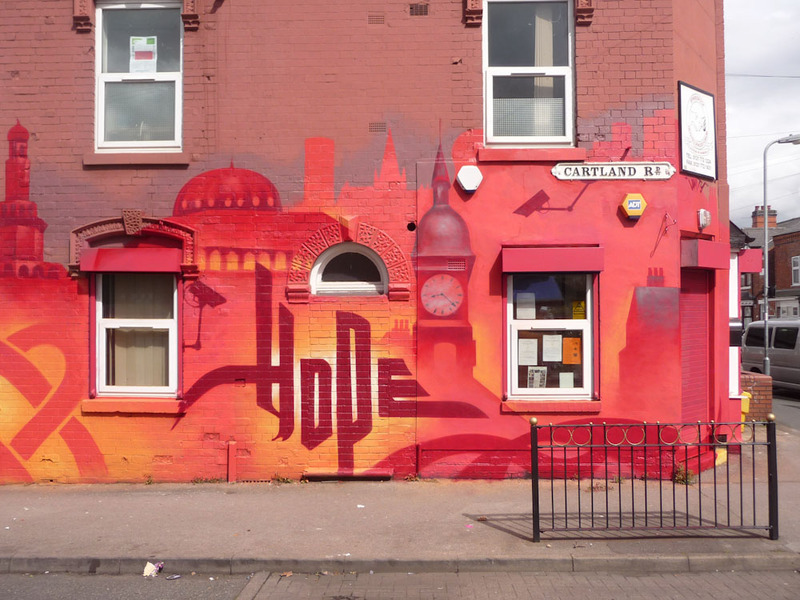 Mohammed invited me from my home in Holland to come and paint a wall in Sparkbrook, an area of Birmingham England where he grew up. What interested me was that Sparkbrook had transformed from an Irish community to an Asian/Muslim one. Both Mohammed and I grew up in The U.K, I have an Irish background and he an Asian/Muslim one. Sparkbrook was a predominantly Irish neighborhood up until the 80′s and nineties when many moved into other wealthier suburbs. Having grown up in London with some Irish heritage I knew about Birmingham’s Irish influence and of course the Birmingham six which highlighted the fact that to be Irish in Britain meant you where associated with terror. Flash forward a decade or so and the same rings true if your Muslim in Britain, Project Champion is a good example of that. Bearing in mind that Sparkbrook is now a predominantly Asian community and most are of Islamic faith, Project Champion was a project to install a £3m network of CCTV cameras to monitor vehicles entering and leaving Sparkbrook. Its implementation was frozen after it came to light that the police deliberately misled councilors about its purpose, it was revealed that it was being funded as an anti-terrorism initiative. The Police believed that because the people of that district are poor (Sparkbrook has the eighth highest level of unemployment in Britain) and a majority are Muslim they were guilty of terrorism. I had all this in mind as we adorned the large wall in the middle of this neighborhood with Intricate Islamic and Celtic (Irish) patterns that blend in out of one another in the way that the demographics of an area might change, as one fades out another one comes in but somehow they are very much connected. It’s a challenge for me as artist from a social realist background to paint a mural with a message and have nothing figurative to work with. 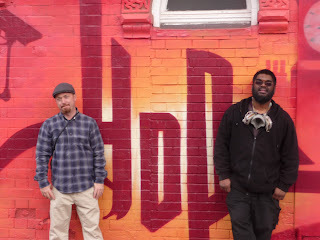 I appreciate this aspect of our collaboration as it pushes me into thinking and working in new and different ways and perhaps that’s part of our message, to smash the stereo types. I don’t like to go into a neighborhood that I know nothing about and just do a painting and leave, as artists we have to respect the fact that for the local people this wall is a part of everyday life. For me I think it is empowering to engage the local people as much as I can, discuss the concept with them, get feedback from them and perhaps invite them to participate. In this way the painting becomes more than just the work of an individual artist but a part of the community and this is empowering to the art, the artist and most importantly the community. An added bonus will be the longevity of the painting because it belongs to the community. 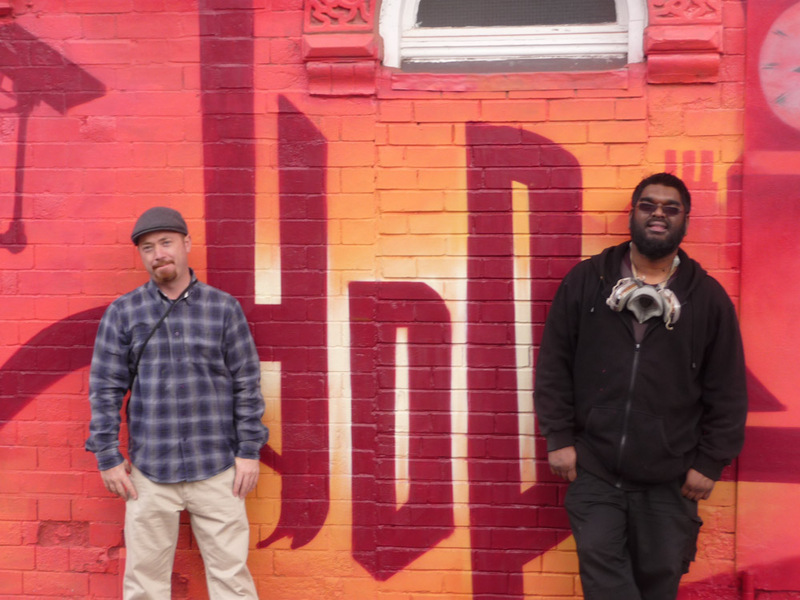 So painting a mural is not about getting your painting up in public, getting a name for yourself as an artist but about giving, sharing and communicating. With this wall we arm the people with hope! I very rarely connect with artists in the way that I have done so with Martin Travers. When i was painting a mural in Amsterdam a few years ago, I was introduced to local artist Martin, and we have kept in touch since. Martin has a very similar outlook and approach to his work, so it really made sense for us to continue working together. I found Martin to be quite passionate about his Irish heritage, much like the way I am about my faith as a muslim. I have painted walls around the globe and in cities around the UK, but I have also painted a number of murals in my home city of Birmingham, but i wanted to bring it down even further, and paint in the very street that i was born and raised. Anderton Road was the street that my father bought his first house. We owned a fish n chip shop on that street around 35 years ago. I went to school there, and would walk past this very long wall every single day. To have the opportunity to paint this wall was something i was excited about and couldn’t wait to get started. 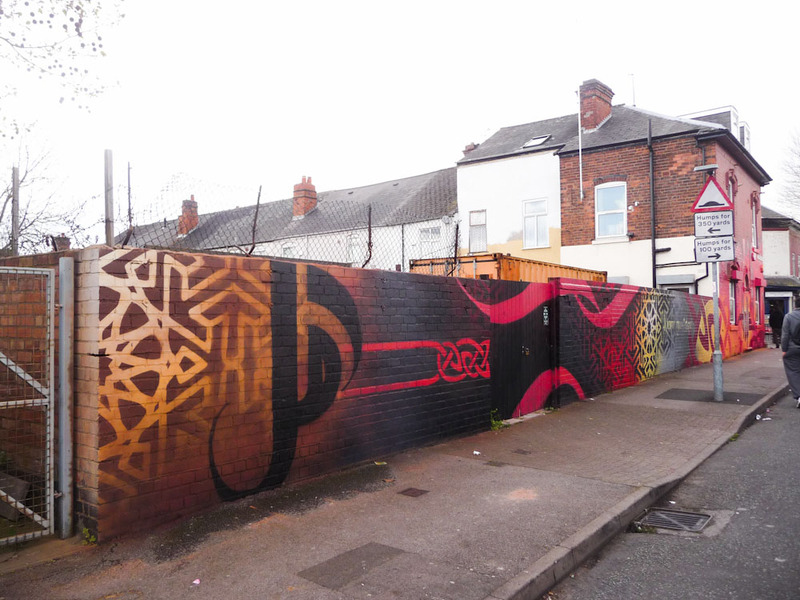 To invite Martin – an artist of Irish heritage, made perfect sense, telling a story through the mural of the changing face of Sparkbrook, how different communities have settled and how people have come and moved on. During the painting over the course of 5 days, we interacted, engaged and chatted to local residents. We eavesdropped on conversations of people who stood and watched, people who came to shop at the grocery store next to us. We heard conversations between children and their parents as they walked back from school, the same route i would take as a child. We heard praise, we heard excitement. Why would two guys come into such an area and want to paint this giant piece of art in their neighborhood. I think people were intrigued. People assumed we had been commissioned, but when we shared with them that this mural was not commissioned by anybody, but something we wanted to do, how Martin had come all the way from Holland to paint this wall, people were surprised. I have painted many walls in some great cities around the globe. New York, Melbourne, Toronto, Singapore… but this wall was special. It was home, the streets that i knew so well. I painted with an artist who i respected, and invited him into my home to bring some colour into the lives of people, who rarely saw such colour in the concrete jungles they lived in.